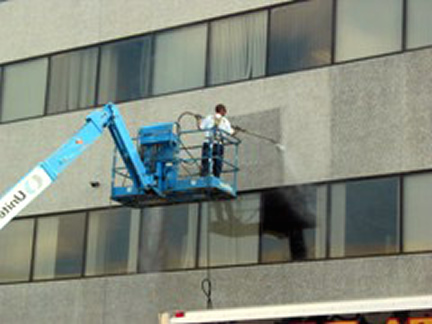 Commercial pressure washing (aka power washing) in Houston is what we do best. 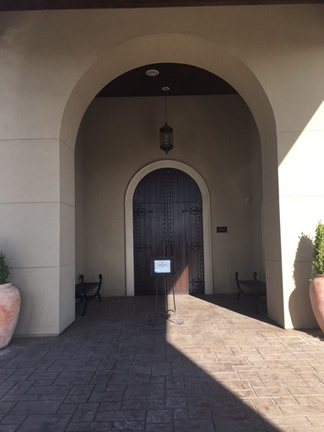 We are Houston’s premier power washing company servicing commercial accounts throughout the entire Metropolitan and Tri-County area. 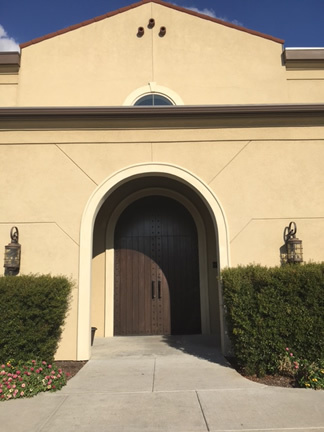 As a business owner, you know that having the exterior of your company looking its best is a top priority to bringing in new customers. 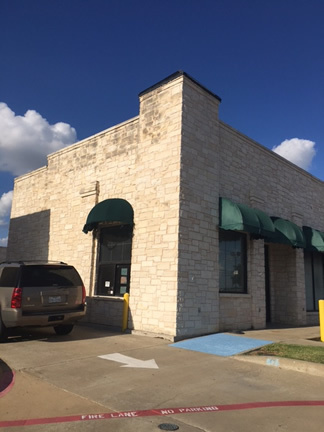 No matter if it is your parking lot, the side of your building, the roof, gutters all the way to the dumpster area, we will make your business shine like new. 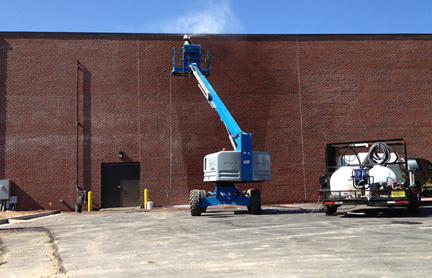 We are the pressure washing specialists and are ready to work with you to determine your current needs, and provide you with the most professional services in the industry. We understand you have a business to run, and are glad to work either day or night to fulfill the schedule that works best for you so we do not interrupt your normal flow of business. We will work with you the business owner, your general contractor, a Project Manager, or anyone you put in charge to work with us. 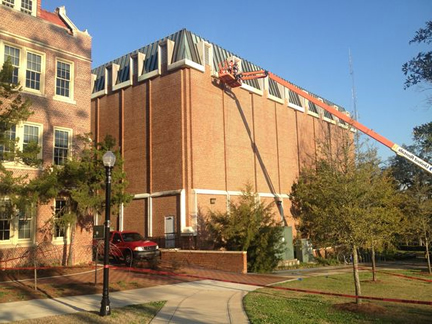 Our crews are trained professionals equipped with state-of-the-art equipment and technologies. Each crew member is trained for the equipment we use to ensure that you receive the highest quality of service from everyone on our team. Your business is your image. Visitors and customers will start judging the quality of your business based on the external appearance of your building. It is amazing to think that people are that judgmental, but the honest fact is most of us are very critical of others based on appearance. Knowing this, you now have the upper hand. Our professional pressure washing services will ensure that you make the best impression on your clients before the even hit the front door. 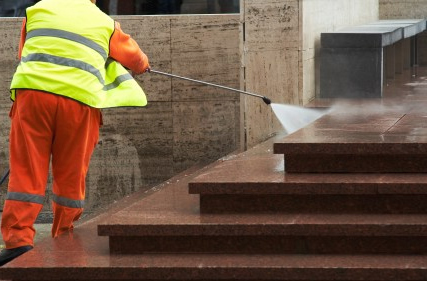 We strive to make you look very good, while keeping Houston clean and beautiful at the same time. 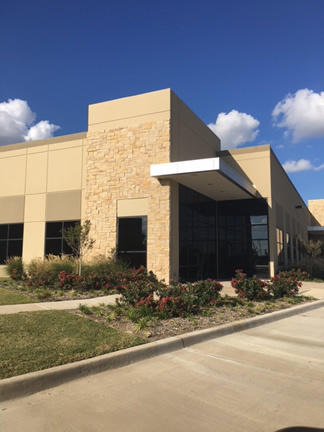 Keeping your physical building clean does not only make for a nice looking building, but also keeping up with regular maintenance can save you costly maintenance fees later on, and also help in preventing potential fire hazards around your business. Due to the high humidity in the Houston area, mold and mildew grow very fast, and on most all surfaces. If you do not keep your business free from these destroying elements you will face the more costly repairs sooner than later. But Wait. Won’t your High Pressure Washer Cause Damage to My Building? Great question and I am glad you asked. Our entire team are highly trained technicians that have great levels of experience and know that we employ different methodologies in the types of washing that occurs depending on the materials we are washing and cleaning. We use many different techniques and will discuss with you the methods we will be using for your property. 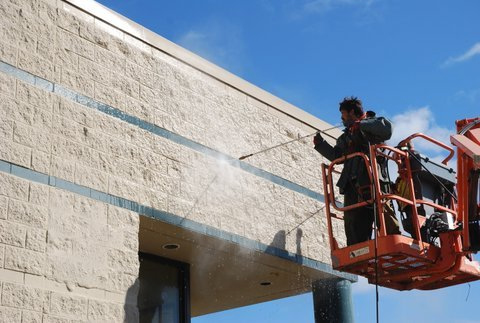 You may have heard this term if you have been looking around at other pressurewashing companies. 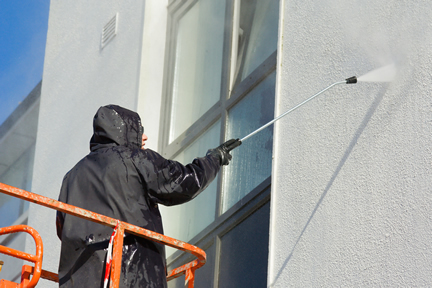 Soft-washing is simply a great way to provide amazing results on your exterior cleaning projects. 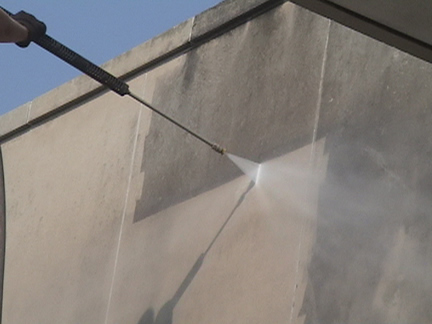 A pressure washer is still used, but at a lower PSI to prevent potential damage that a pressure washer can cause to some surfaces when using a very high PSI. 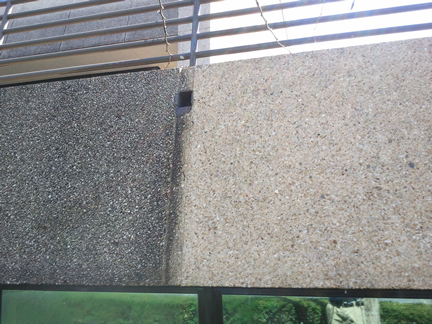 This soft-washing technique is a very safe and effective method for cleaning many surfaces that would otherwise potentially face damage. 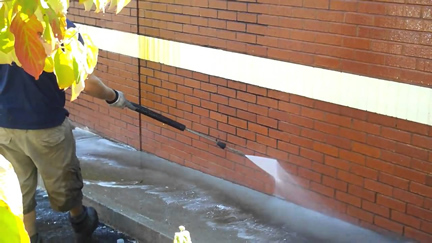 As I mentioned earlier our techs are trained in all methods and will know when this technique should be used for washing buildings and other surfaces. It is no surprise that parking lots and sidewalks can get very dirty here in the Houston area. With over 2 million people in the city alone (not counting the suburbs), that is a lot of shoes, tires, gum, drink spills, spit, oil, grease, dirt, bird droppings, blood, … you name it can get all over the place and over time cause things to look very bad. 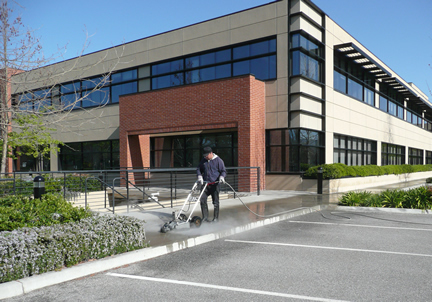 We all know that you only get one chance to make a first impression so keeping the concrete areas around your business clean is a great way to ensure your property is not only well maintained, but clean for your customers. We use the latest technologies, for cleaning concrete, and will assess the situation to determine the proper tools to use for the job. We all know that there is never a one-size-fits-all tool that will do the job correctly every time. 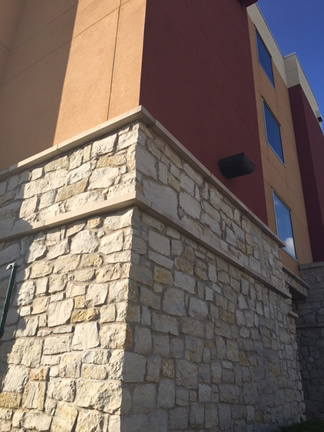 Since we know every project is different, we will come out prior to starting on your job and assess the current condition of the concrete. We will take note of all the types of problem areas (ie. Oil stains, grease, brake fluid, transmission fluid, tree sap, gum, graffiti, mold, algae, etc.) Once we know what we are dealing with, we will put a plan together so we know what types of chemicals or and equipment we will be using for your specific project to ensure you receive the level of cleanliness. If you have lived in Texas for very long, especially here in Houston, you have experienced the high humidity levels. These crazy humidity levels are very conducive to mold and mildew growing rapidly on basically every surface you can imagine. It is very important that you keep up with a normal maintenance schedule to keep your property (especially your roof) clean and protected in order to reduce costly repairs in the future. We are seeing more and more cases where some insurance companies are not paying for damages when it is discovered that there is a major mold, algae, or dirt build up problem, claiming poor maintenance as a cause for the damages. You can definitely increase the life of your roof with proper care and maintenance. 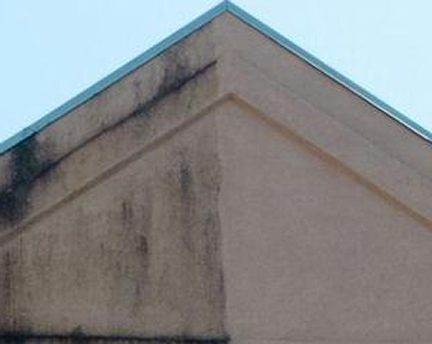 Your commercial building roof is no different from a residential roof when it comes to maintenance and keeping it free from dirt, debris, mold, mildew, algae, pigeons, etc. You need to call on the pros to make sure your roof is properly cleaned and maintained. Are you regularly having your dumpster area cleaned? If not you could potentially be causing serious health and environmental issues. Regular cleaning of your dumpster area is highly recommended to prevent things like rodent issues, bad odors caused by the growth of bacteria, and insect infestations. By keeping this area clean you also help prevent accidents that can include slipping and falling especially if there are greasy or slippery areas near the dumpster. Not only do we clean your dumpster area, we will degrease the area, deodorize and sanitize the entire area. You dumpster area will look immaculate, and your neighbors will be impressed with how well you maintain your business by keeping it fresh and clean. 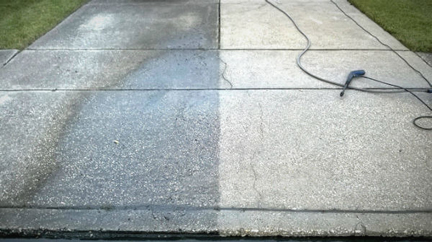 We would love to provide you with a FREE estimate for your current power washing project. Since each case is different, we will need to speak with you and possible come out to assess the scope of the project so we can provide you with the most accurate quote possible. We do offer the most competitive pricing in the area, so we are confident you will be satisfied with not only the quote we provide to you, but the work we complete once we start the job. We would love to also work with you, and set up a continued maintenance scheduled for your property. 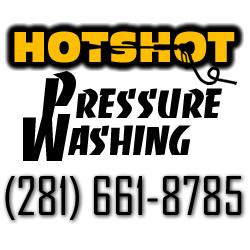 We do understand there are many different pressure wash companies servicing the Houston Tri-County area, and we know you have a choice for whom to call for services. We do appreciate you allowing us to bid on your project. We know you will not be disappointed as we strive to provide the best customer service experience in the industry. ​we will be in contact with you very soon. If you are not located in one of the cities we have listed above in our service area, we would still love to help you with your power washing project. Give us a call at the number listed below, email us, or use the form on the right hand side of the page, and we will work out the logistics of completing your pressure washing job and will give you an estimate.